Organic syrups There are 4 products. 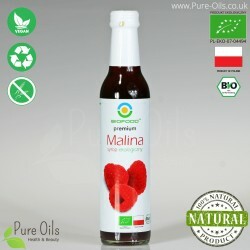 Raspberry syrup is a 100% natural product made from raspberry juice. The syrup comes from organic farming and it has the BIO Certificate No. PL-EKO-07-04494. Not from concentrate. Raspberry & agave syrup is a 100% natural product made from raspberry juice. The obtained raspberry syrup is sweetened with an organic agave syrup. The product comes from organic farming and it has the BIO Certificate No. PL-EKO-07-04494. Not from concentrate.